Every day, security researchers and hackers discover new vulnerabilities, augmenting the tens of thousands of known holes in applications, services, operating systems, and firmware. A vulnerability scanner provides automated assistance for tracking known vulnerabilities and detecting your exposure to them. 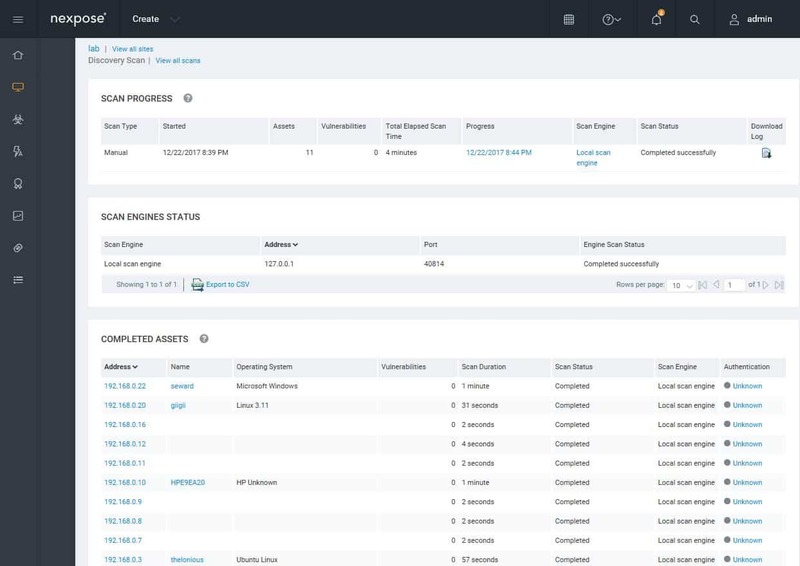 SolarWinds Network Configuration Manager (FREE TRIAL) – Free for 30 days with no obligation to move on to the paid version, this is a very comprehensive configuration manager that scans for device settings that create vulnerabilities. 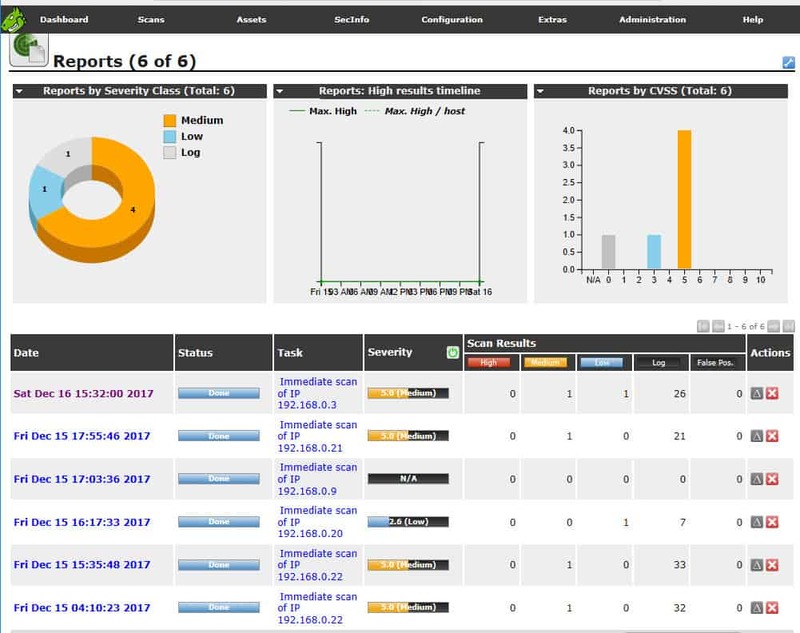 Paessler Network Vulnerability Monitoring with PRTG (FREE TRIAL) – Part of the PRTG resource monitoring system, this tool checks logs and monitors traffic patterns as well as guarding ports and resource usage. It is free to use for up to 100 sensors. OpenVAS – The Open Vulnerability Assessment System is a free vulnerability manager for Linux that can be accessed on Windows through a VM. 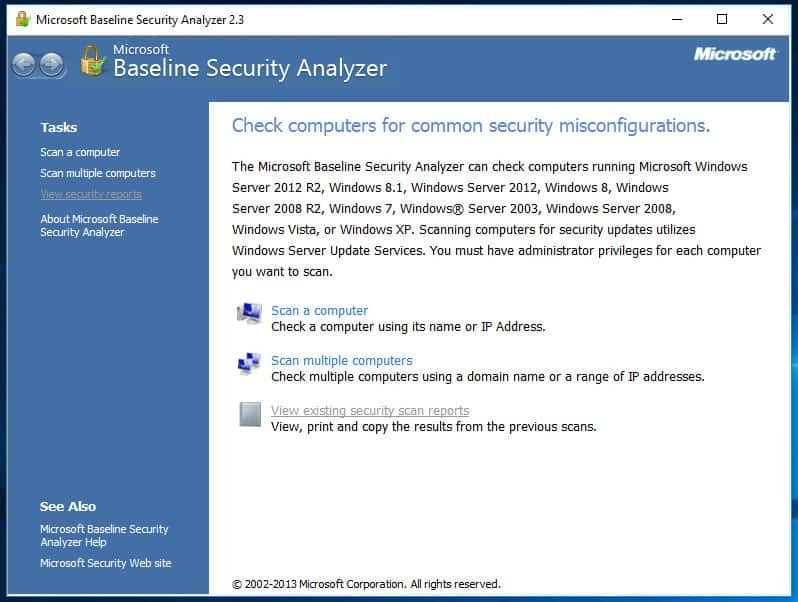 Microsoft Baseline Security Analyzer (MBSA) – Free and easy-to-use tool that check Microsoft products for vulnerabilities. Retina Network Scanner Community Edition – Free to scan up to 256 IP addresses, this system relies on a central database of known weaknesses. Nexpose Community Edition – Free for scans of up to 32 IP addresses, this tool discovers and logs your network-connected devices, highlighting any known vulnerabilities in each. 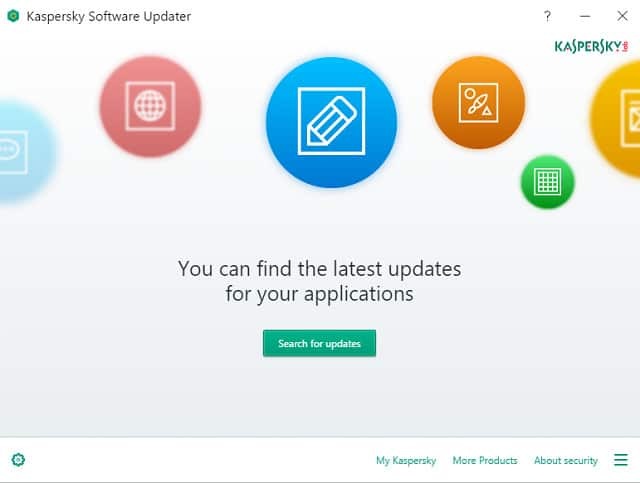 Kaspersky Software Updater – A free utility for Windows that will install available updates for any of your software, not just Kaspersky products. 1 Who needs a network vulnerability scanner? 2 How does a network vulnerability scanner work? Who needs a network vulnerability scanner? Any network beyond the smallest office has an attack surface too large and complex for purely manual monitoring. Even if you are only responsible for a few hosts and devices, you need automated assistance to efficiently and thoroughly track the burgeoning list of known vulnerabilities and ensure that your network is not exposed. Nowadays most operating systems provide automated software updates. For a small organization, that may be sufficient. But how much of your installed software does that cover? And what of misconfigured services or unauthorized software that has popped up in your network? The “hack yourself first” adage suggests that any host or device exposed to the internet should be penetration tested, and the “defense in depth” principle says that even “internal” hosts and devices must be audited regularly. A vulnerability scanner provides automated assistance with this. Like many network administration tools, a vulnerability scanner has both legitimate and illegitimate uses. It can be helpful to the system administrator, developer, security researcher, penetration tester, or black-hat hacker. It can be used for assessing exposure in order to secure your network, or for seeking viable exploits to enable breaking into it. How does a network vulnerability scanner work? A vulnerability scanner relies on a database of known vulnerabilities and automated tests for them. A limited scanner will only address a single host or set of hosts running a single operating system platform. A comprehensive scanner scans a wide range of devices and hosts on one or more networks, identifying the device type and operating system, and probing for relevant vulnerabilities with lesser or greater intrusiveness. A scan may be purely network based, conducted from the wider internet (external scan) or from inside your local intranet (internal scan). It may be a deep inspection that is possible when the scanner has been provided with credentials to authenticate itself as a legitimate user of the host or device. Vulnerability scanning is only one part of the vulnerability management process. Once the scanner discovers a vulnerability, it must be reported, verified (is it a false positive? ), prioritized and classified for risk and impact, remediated, and monitored to prevent regression. Your organization needs a process – more or less formal – for addressing vulnerabilities. A vulnerability management process includes scheduled scans, prioritization guidance, change management for software versions, and process assurance. Most vulnerability scanners can be part of a full vulnerability management solution, so larger organizations need to look at that context when selecting a scanner. Many vulnerabilities can be addressed by patching, but not all. A cost/benefit analysis should be part of the process because not all vulnerabilities are risks in every environment, and there may be business reasons why you can’t install a given patch. Thus it’s useful when remediation guidance from the tool includes alternative means (eg, disabling a service or blocking a port via firewall). When choosing a vulnerability scanner there are many features to evaluate. 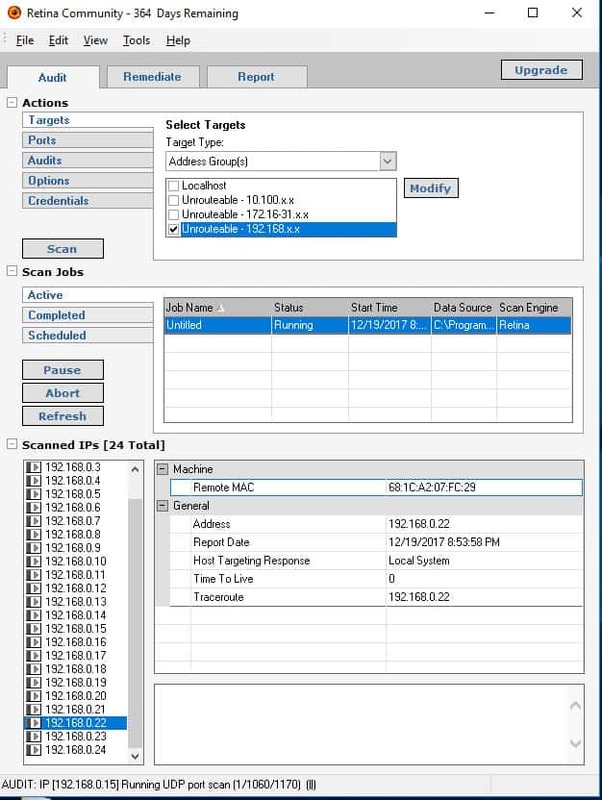 Is the scanner network-based, doing host/device discovery and target profiling? What is the range of assets it can scan – hosts, network devices, web servers, virtual machine environments, mobile devices, databases? Does that fit your organization’s needs? Is its vulnerability database comprehensive and a good match for your network’s platforms? Does the database automatically receive a regular feed of updates? Is the scanner reliable and scalable? Are the scanner’s tests unnecessarily intrusive? Does scanning impact hosts/devices thereby slowing performance and potentially crashing poorly-configured devices? Can you set up scheduled scans and automated alerts? Does it provide canned policies (e,g. for particular compliance regimes)? Can you define your own policies? Are scan results easy to understand? Can you sort and filter? Can you visualize trends over time? Does it provide useful guidance about prioritization? Does it help with remediation? Are the instructions clear? How about automated remediation through scripting? Does it provide, or integrate with, automated software updating services to install service packs and patches? What is the range of canned reports it provides, and what is their quality? Does it provide any compliance reports you need? Can you easily define your own report formats? The vulnerability scanner is only one source of information and is not a replacement for having knowledgeable staff. Like many network administration tools targeted at enterprises, a high-end vulnerability scanner tends to be expensive. Good no-cost options are available, but many are limited in the size of the network they’ll handle, and all entail the cost of paying staff to learn the tool, install and configure it, and interpret its results. Thus, you should evaluate whether paying for more automation and support may be cheaper in the long run. Installing a scanner can be complex, and likely the scanner will initially grind for a few hours to fetch updates to its vulnerability database and preprocess them. Also, depending on the number of hosts and the depth of the scan selected, a given scan can also take hours. When selecting the tools that would make up this list, our main considerations included the reliability and industry reputation of the software vendor, their ability to keep their product maintained and up to date, unique features, ease of setup and use, and scalability options. SolarWinds Network Configuration Manager (NCM) is an outlier in our list; it is only free for an evaluation period and covers a particular (but important) subset of vulnerabilities. NCM handles both vulnerability scanning and management for the domain of vulnerabilities arising from router and switch misconfiguration. It focuses on remediation, monitoring for unexpected changes, and compliance auditing. NCM is only free during a fully-functional trial of 30 days. 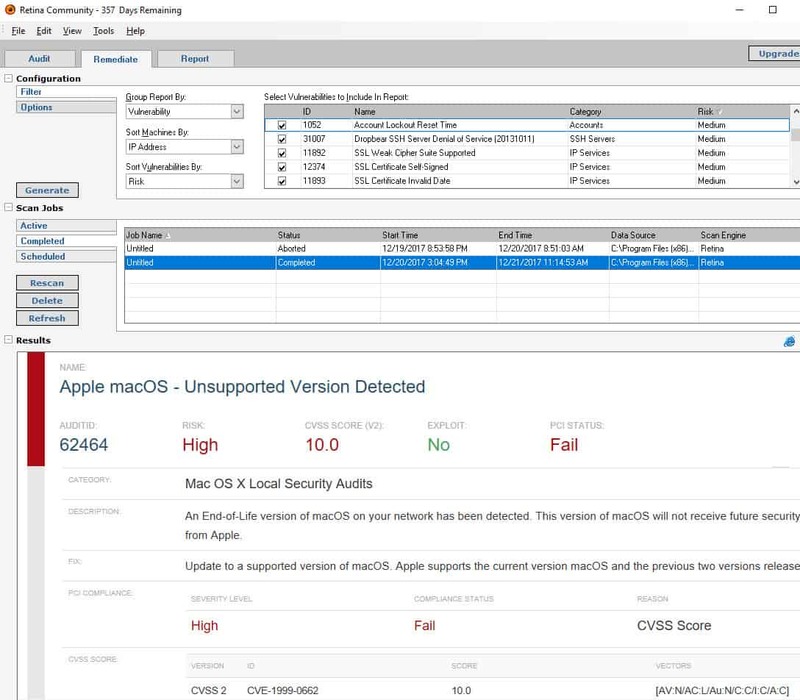 NCM scans for vulnerabilities in the configurations of Cisco Adaptive Security Appliance (ASA) and Internetwork Operating System (IOS®)-based devices. For vulnerabilities due to configuration errors, it provides the ability to run remediation scripts automatically upon detection of a violation, and automatically deploy standardized configuration updates to hundreds of devices. To address unauthorized changes including regressions, it provides configuration change monitoring and alerting. It can continuously audit routers and switches for compliance. It performs National Institute of Standards and Technology (NIST®) Federal Information Security Management Act (FISMA) and Defense Information Systems Agency (DISA®) Security Technical Implementation Guide (STIG) compliance reporting out-of-the-box. For the trial, a lightweight install can install and use SQL Server Express, but the database is limited to 10 gigabytes. 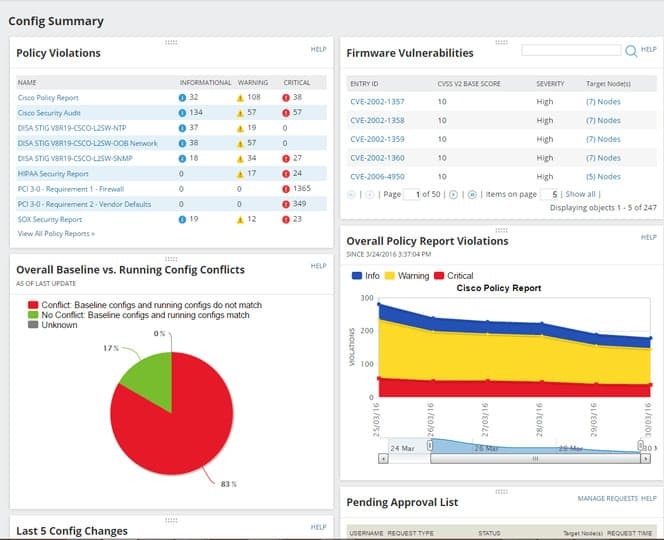 More comprehensive than the other tools on the list, NCM has advanced options to create and monitor configuration policies and issues arising from them (issues most commonly arise when configurations are being changed). On top of that, it offers vulnerability scanning, as well a the ability to run remediation scripts automatically for configuration issues and roll out standardized configurations to hundreds of clients. Our choice as it’s the most comprehensive tool listed. The Paessler system monitoring product is called PRTG. It is a unified infrastructure monitoring tool that covers networks, servers, and applications. PRTG is a bundle of tools and each of those utilities is called a ‘sensor.’ The package has a number of sensors that guard your business against network attacks. Any security assessment has to begin with a check on all of your existing infrastructure. PRTG discovers and monitors all of your network devices for status changes and alert conditions. Network traffic monitoring provided by PRTG can also highlight unusual activities that might indicate an intrusion. A packet sniffing sensor can be used for deep packet inspection, giving you data on the protocol activity in your traffic. This can be identified by port number or traffic source or destination, among other identifiers. PRTG packet sniffer sensor output screen. The Syslog Receiver module in Paessler PRTG will prove more security scanning features to your system defense strategy. Network attack leave a paper trail and gathering Syslog and Windows Event Log messages is step one in your vulnerability scan strategy. 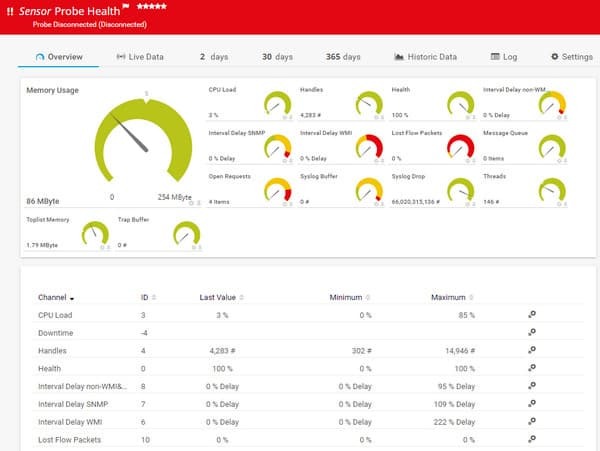 PRTG is a pure monitoring system, so it doesn’t include any active management and resolution functions, such as patch management or configuration management. However, it does include some extra security assessment features, such as its port scanning and monitoring utility. Any factor monitored by PRTG can be used as a feed into the tool’s alerting system. 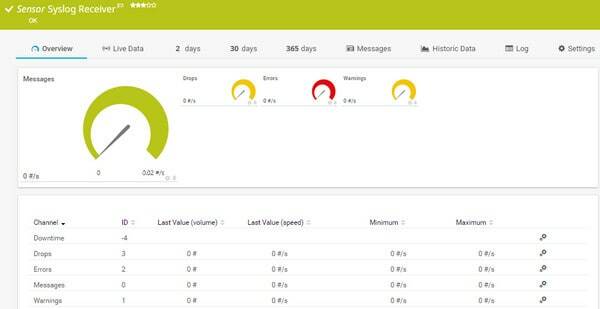 Factors such as log message volume, log message severity, SNMP Trap data and port activity can all be included in custom alerts. Paessler sets charging bands for PRTG that are based on the number of sensors that are activated. Every customer receives delivery of the full PRTG system, but with all of its sensors inactive. You customize your own implementation by activating desired sensors. You can use PRTG for free permanently if you only activate up to 100 sensors. You can get a 30-day free trial of PRTG with unlimited sensors in order to check out its network protection features for yourself. You benefit from full user support, system updates and security patches even while you are in the free trial period. 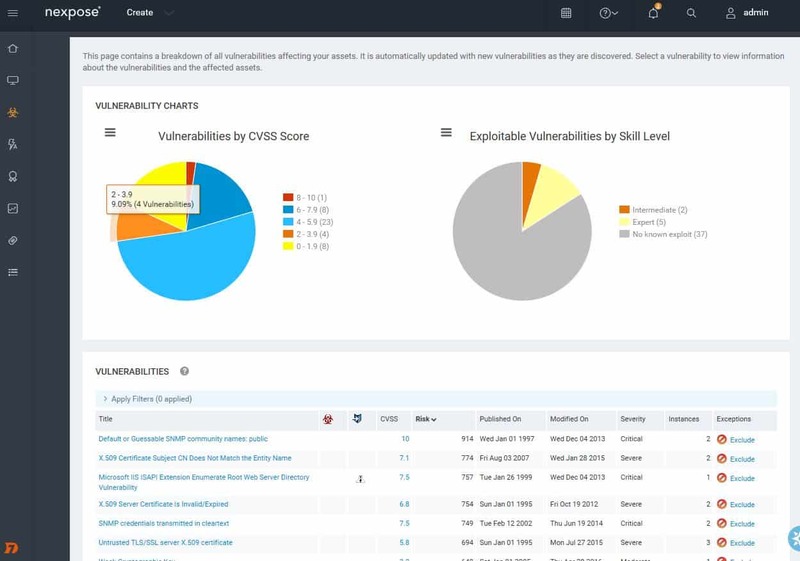 The Open Vulnerability Assessment System, OpenVAS is a comprehensive open source vulnerability scanning and vulnerability management system. It’s free of cost, and its components are free software, most licensed under the GNU GPL. It was forked off the renowned (and costly) vulnerability scanner Nessus when Nessus became a proprietary product. 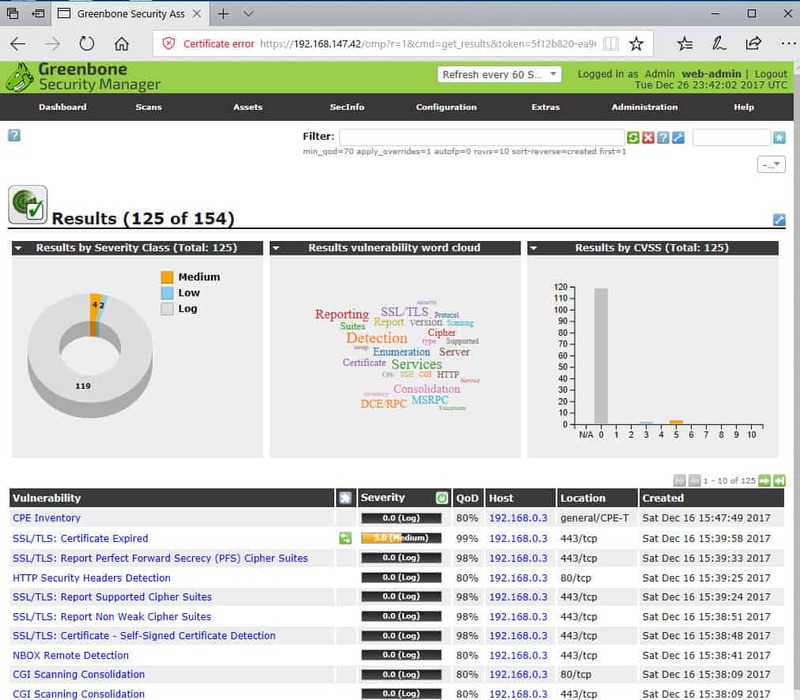 OpenVAS is also part of Greenbone Network’s for-cost vulnerability management solution. OpenVAS uses an automatically-updated community feed of Network Vulnerability Tests (NVTs), over 50,000 and growing. Greenbone’s for-cost product provides an alternative commercial feed of vulnerability tests that updates more regularly and has service guarantees, along with support. OpenVAS is available as packages in multiple Linux distros, in source code form, and as a virtual appliance that can be loaded into a VM on Windows. It is also part of Kali Linux. 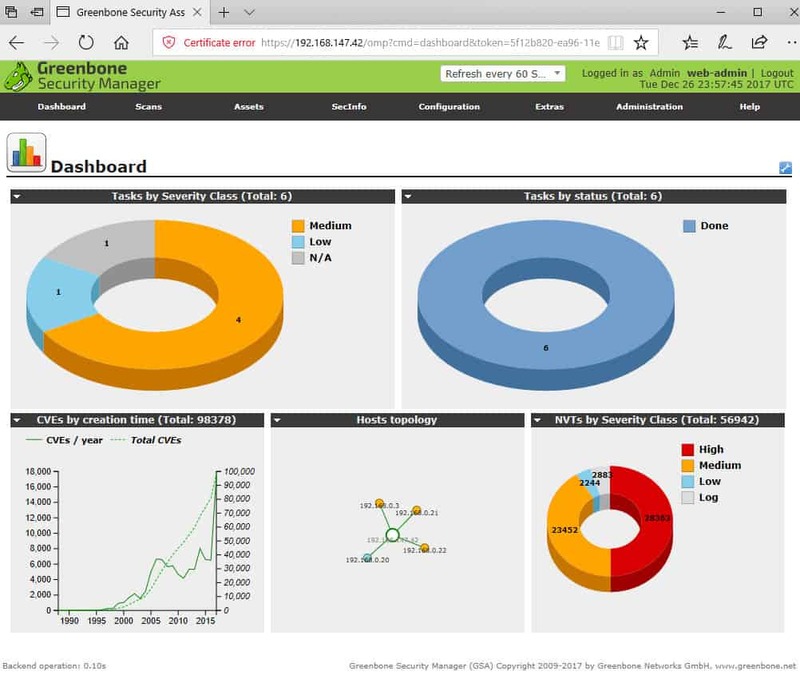 OpenVAS has a web-based GUI, the Greenbone Security Assistant, a Qt-based GUI, the Greenbone Security Desktop, and a CLI. Once you are logged in on the web-based GUI you can run your first scan via the Scans menu item: Scans > Tasks. then on the Tasks page use the Task Wizard button near the upper left. When you’ve run a scan task, the Scans > Results page lists the vulnerabilities found. 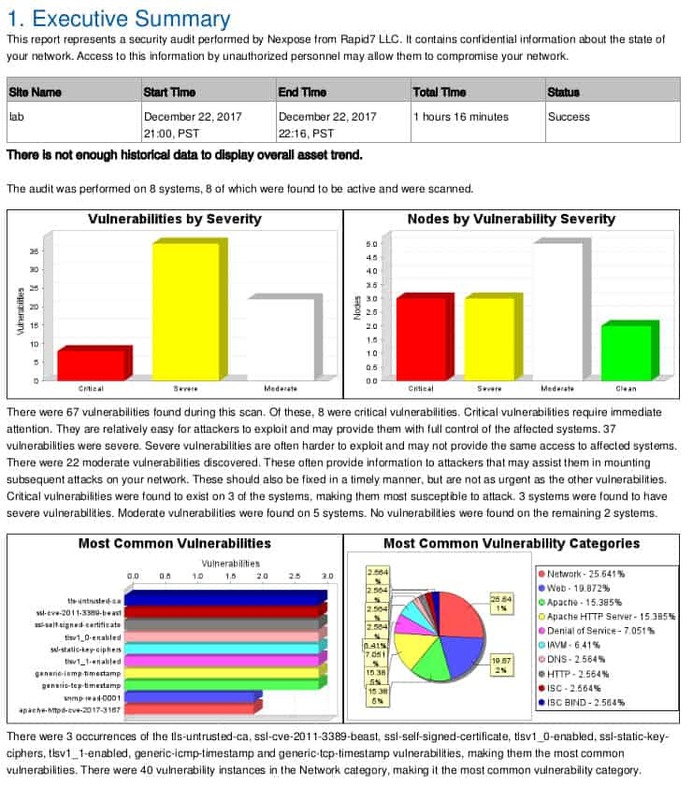 OpenVAS Results page summarizes vulnerabilities found. You can drill down to a particular vulnerability for an explanation and remediation help. Details on a particular vulnerability. Reports can be exported in various formats, and delta reports can be generated to look at trends. Installing and using OpenVAS has a significant learning curve. 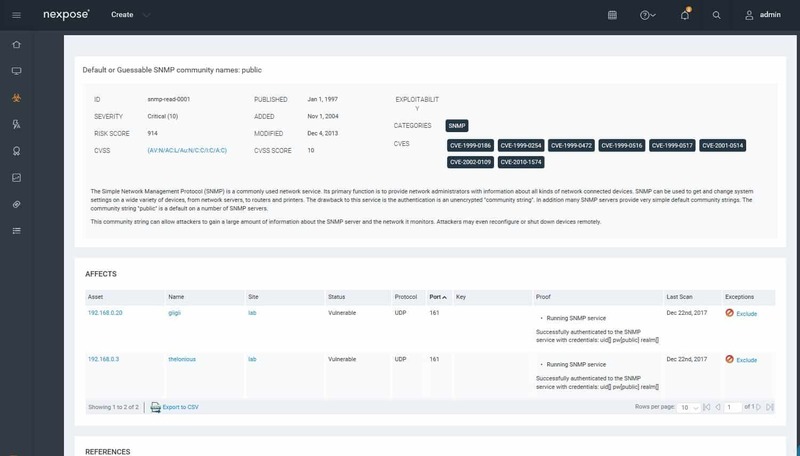 Although free, OpenVAS is not simply a vulnerability scanner but a full-up free open source vulnerability management platform. The steep learning curve is one of the main reasons a lot of network administrators look for alternatives to OpenVAS, particularly those that prefer a less hands-on approach while still requiring the robustness of a competent tool. This is why OpenVAS comes in at third on our list after the SolarWinds and Paessler offerings. 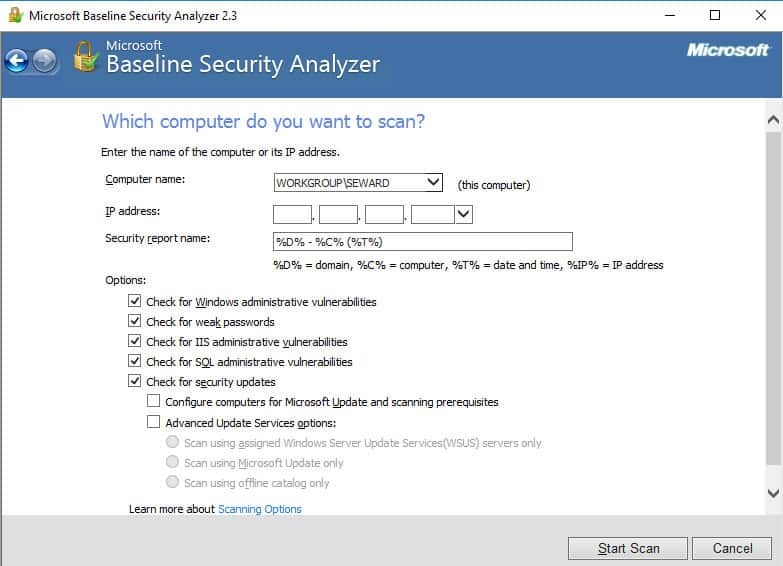 Microsoft Baseline Security Analyzer (MBSA) is an old staple, an on-host vulnerability scanner restricted to the domain of vulnerabilities in Microsoft products. It’s getting long in the tooth but is still useful for smaller businesses primarily running Windows. MBSA is a straightforward tool that only scans Windows machines for particular Microsoft-specific issues and basic vulnerabilities and misconfigurations. MBSA can scan the local host, a domain, or an IP address range. MBSA can scan one or multiple Windows computers. MBSA scans for missing service packs or security updates. It also scans for administrative issues in Windows, Windows Firewall, IIS, SQL Server, and Office applications. MBSA checks for missing updates and simple administrative issues. MBSA generates a report for each host scanned, with issues labeled by priority. 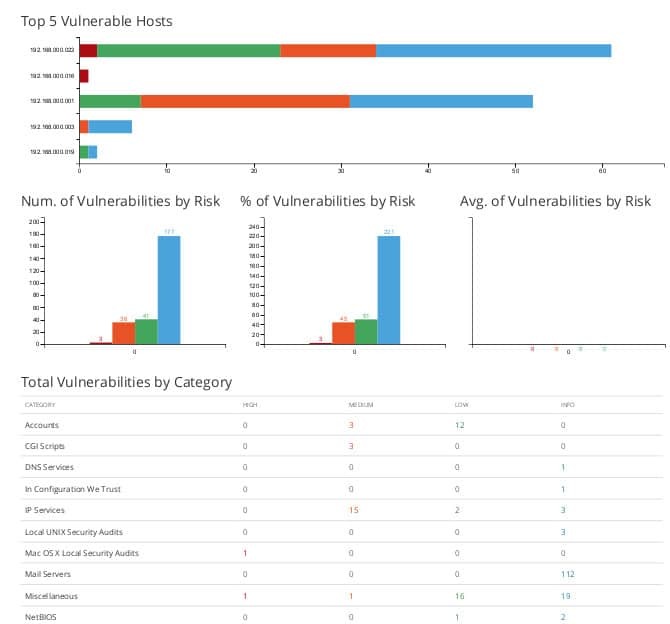 Report of vulnerabilities in Microsoft products and services like SQL Server. MBSA has not yet been updated for Windows 10, but version 2.3 largely works. Some tweaking is required to clean up false positives and fix checks that cannot be completed. For instance, it will give a false-positive complaint about Windows Update not being enabled. MBSA does not deal with non-Microsoft vulnerabilities or complex vulnerabilities, but it is simple to use and still handy for small Microsoft-oriented shops. Retina Network Security Scanner Community Edition (RNSS) is a comprehensive vulnerability scanner and can be paired with a for-cost full-lifecycle vulnerability management system. RNSS is free for scans of up to 256 IP addresses. It was developed by eEye, which is now part of BeyondTrust. The Retina scanner’s extensive vulnerability database is automatically updated and identifies network vulnerabilities, configuration issues, and missing patches, covering a range of operating systems, devices, virtual environments, and applications. Installation is straightforward and the user interface is intuitive. Once a scan has been run via the Audit tab, you can inspect the vulnerabilities on the Remediate tab. Retina Remediate tab lists vulnerabilities found. Vulnerabilities can be sorted and filtered, and you can drill down to individual vulnerabilities. Drilling down to a vulnerability for guidance. You can generate various kinds of reports to access scan results outside the tool. Start of Retina scan report in PDF. The Retina Network Security Scanner is the scan engine for Retina CS Enterprise Vulnerability Management, a full vulnerability assessment and remediation solution which can perform scheduled scans, alerts, historical trend tracking, configuration compliance, patch management, and compliance reporting. Nexpose Community Edition is a comprehensive vulnerability scanner by Rapid7, the owners of the Metasploit exploit framework. The free version of Nexpose is limited to 32 IP addresses at a time, and you must reapply after a year. Nexpose runs in Windows, Linux, and VM appliances. It scans networks, OSes, web apps, databases, and virtual environments. 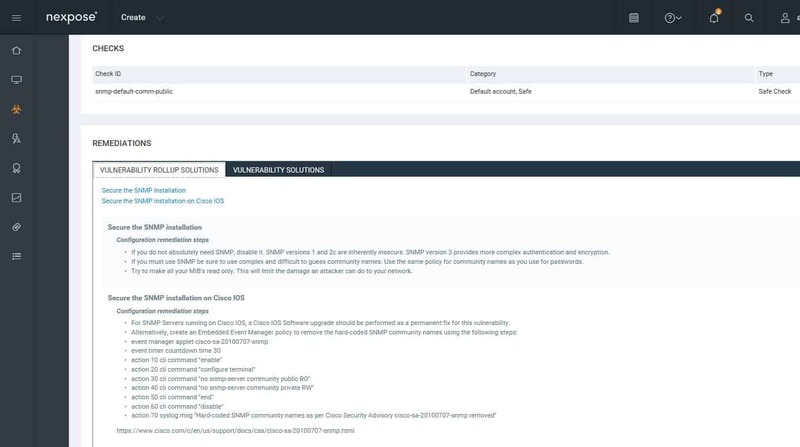 Nexpose can be paired with Rapid7’s for-cost InsightVM vulnerability management system for a comprehensive vulnerability management lifecycle solution. The Community Edition comes with a trial of Rapid7’s web-based console. The online help, behind the “?” icon, is your most helpful asset when getting started. In the web GUI, you define one or more “sites” – networks of interest – for instance, by providing a CIDR address range. You can then choose from one of several predefined scan templates. Nexpose web GUI has multiple predefined scan templates. A Discovery Scan identifies all the devices and hosts in your specified address range. Nexpose Discovery Scan finds assets on the network. 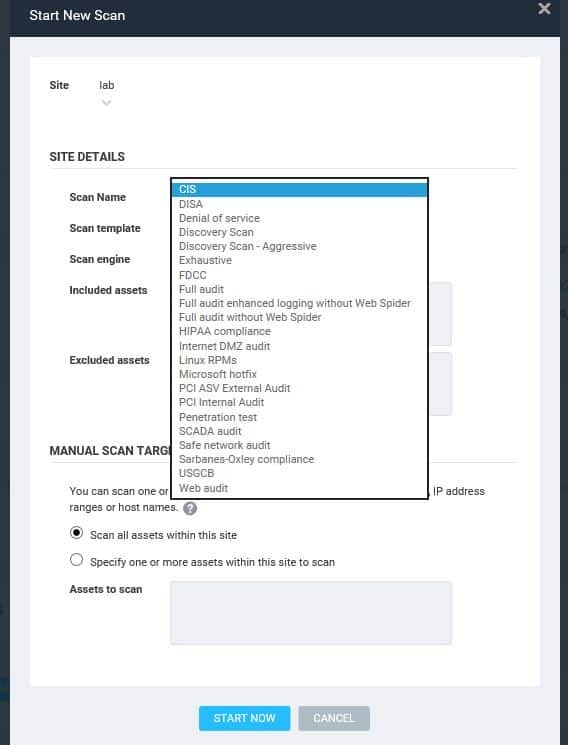 After that, running a Full audit enhanced logging without Web Spider gives you a good initial look at vulnerabilities on your site. You can drill down to find details of vulnerabilities. Drilling down to details on a vulnerability. You can look at the vulnerabilities status of a particular host or device. Each vulnerability includes guidance for remediation. The web console provides multiple predefined reports. Nexpose’s report analyzes vulnerabilities found. You can also set up scheduled scans, enable compliance policies, and track the history of the site’s exposure to vulnerabilities. One big security flaw on your network is actually the condition of the computers connected to it. Software houses constantly look for security weaknesses in their products and produce updates to be installed by existing customers in order to close off any security loopholes. These weaknesses are not the result of negligence when the software was originally written. They arise because hackers are constantly looking for new ways to use software features to breach security. Keeping track of the existence of new updates can be time-consuming, so a program that scans your computer and keeps a list of available updates will save you a lot of time. Kaspersky Labs is a leading antivirus producer and it has made the free Software Updater available for Windows users. The tool doesn’t just monitor Kaspersky products but refers to a large library of update notifications held by Kaspersky. After you download the free tool from the Kaspersky site, the utility will install itself. The installation process also creates a shortcut icon on your Desktop. When you open the tool, all you have to do is click on a button in the Welcome screen. 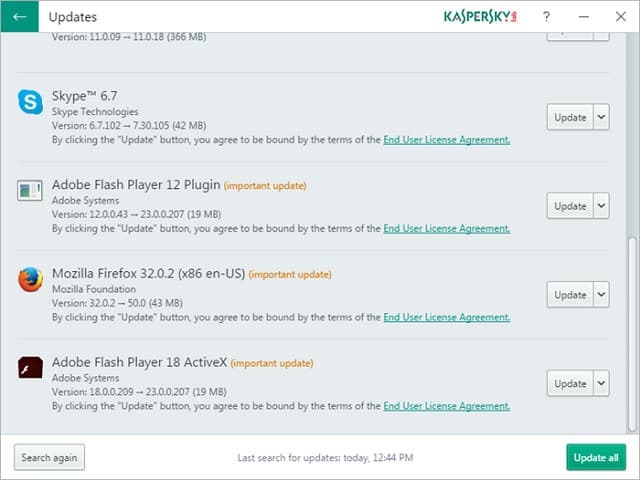 Before scanning your computer, the tool checks with the Kaspersky server to get the latest list of available updates. After the scan finishes, if everything is okay, then you will get the message that there are no updates available. If out-of-date software is encountered, the Software Updater will list them in a results screen similar to the one below. You have the choice of which software you want to update, or you can select to update all of the listed apps. Whichever you choose, the tool will update the software without any further intervention from you. If the six best network scanners in our list don’t quite fit your needs, you might consider one of these alternatives, which are “bubbling under” the leaders. The Tripwire Enterprise package of security vulnerability checks is not free but you can try a demo. However, you can get it on a free trial. 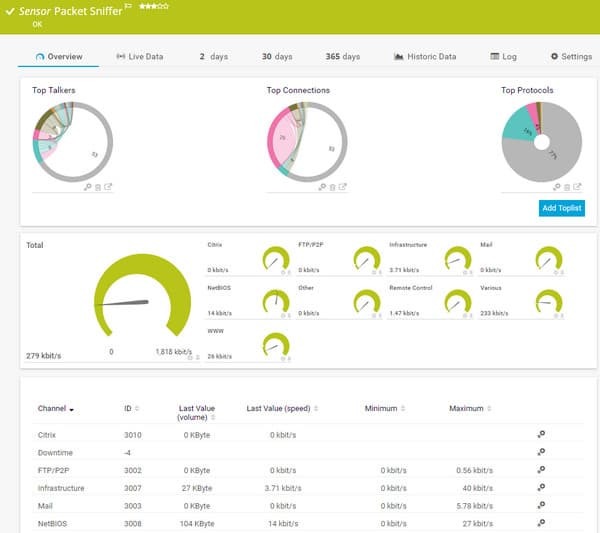 This service not only scans your network for anomalies on demand, but runs in real-time, alerting you to any configuration or data changes on your network and enforcing change control. Qualys FreeScan is an online service that examines a server or network for security weaknesses. It will identify your server software and check that they are up to the latest patches. The scan will also search for infection or intruder activity. This service is not free forever, after 10 scans you have to pay. High-Tech Bridge offers a range of network vulnerability scanning services under the brand ImmuniWeb. 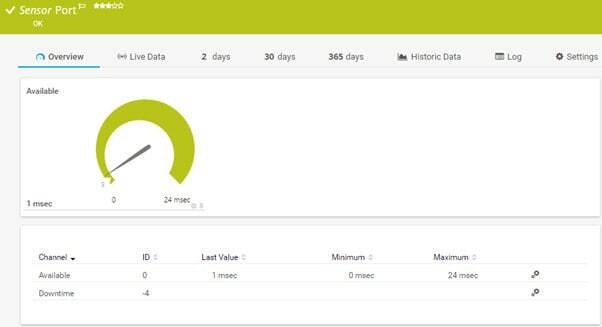 This is a very sophisticated AI-based system that can be used as a one-time service or contracted in on an SLA for continuous monitoring, consultancy, and advice. This solution is very pricey, but you can ask for a free trial. Netsparker is available as an on-premises application or as a cloud service. This is a very expensive option, which is the main reason that it does not appear in the main list of this guide. 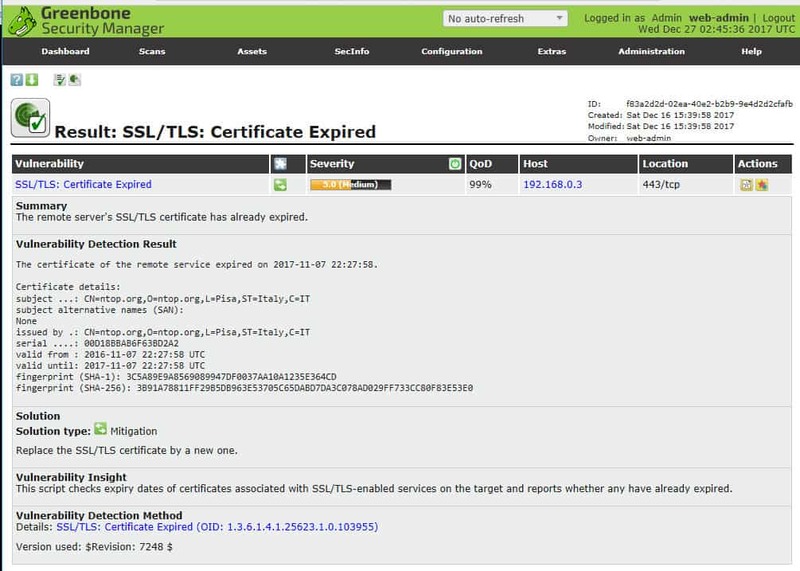 The vulnerability scanner is aimed at web servers and authenticates the activities of all applications that operate to support a web-based enterprise. Vulnerability scanning – and in fact, vulnerability management – is one aspect of protecting your network. Scanners can only detect vulnerabilities that already have tests implemented. You also need to develop a sense of your network’s normal behaviors, via bandwidth monitoring and analysis tools, particularly tools that let you specify automated alerts. When you sense an anomaly and must investigate, network analyzers and packet sniffers are key tools. And there are many other kinds of security tools for the network administrator. Vulnerability scanning is an important tool to help defend your network. There are multiple free options to try out; the right one for your organization is based on your needs, funding, and expertise – or willingness to learn. Image from “Coast Guard cyber experts aim to delete computer hacking”, labeled for reuse with modification.